today was below 60° – in texas, we call this “winter.” but no matter where you’re living, these chilly days are perfect soup weather. 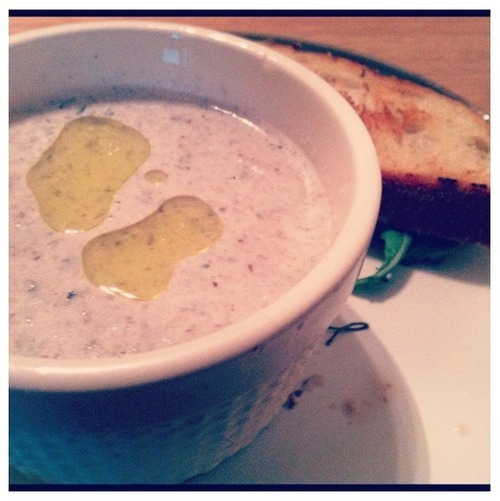 i’ve been waiting for my new emulsion blender to ship, but i couldn’t put this mushroom soup off any longer! it turned out to be oh-so-yummy and super simple. mushrooms are one of my favorite ingredients- so unapologetically earthy and beautiful. 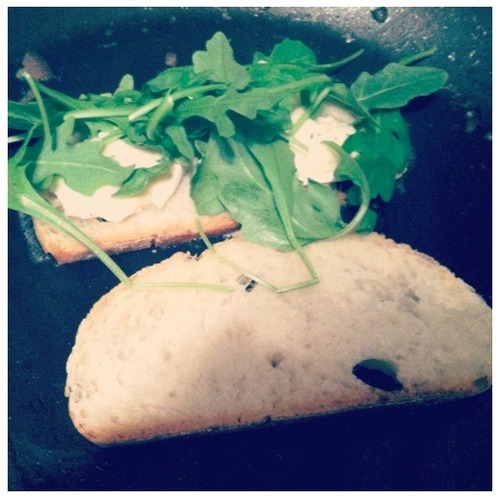 i made a little brie & arugula grilled cheese to dip. grilled cheese & soup? fugetaboutit. heat a large pan and add 1 tablespoon of butter. add the sliced red onion and saute until they are soft, then add 2 tablespoons of butter and saute the sliced mushrooms until they are soft and happy. season with the sprigs of thyme, a splash of dry white wine, and salt & pepper. I also threw in a pinch of nutmeg. once the mixture tastes great (let your tastebuds decide! ), transfer to a blender (or if your emulsion blender has arrived, use that guy). pour in the milk and stock and blend until smooth. i got the soup back on the stove so it was nice and hot when i was ready to eat. serve this soup with a bit of olive oil drizzled on top, and a yummy dipper on the side. i did a grilled brie & arugula sammy. easy, delicious, & enough for lunch leftovers all week!